Plumpton parish boasts a wealth of lovely walks traversing its ancient woodlands to the north and extending into the South Downs National Park at its southernmost end. 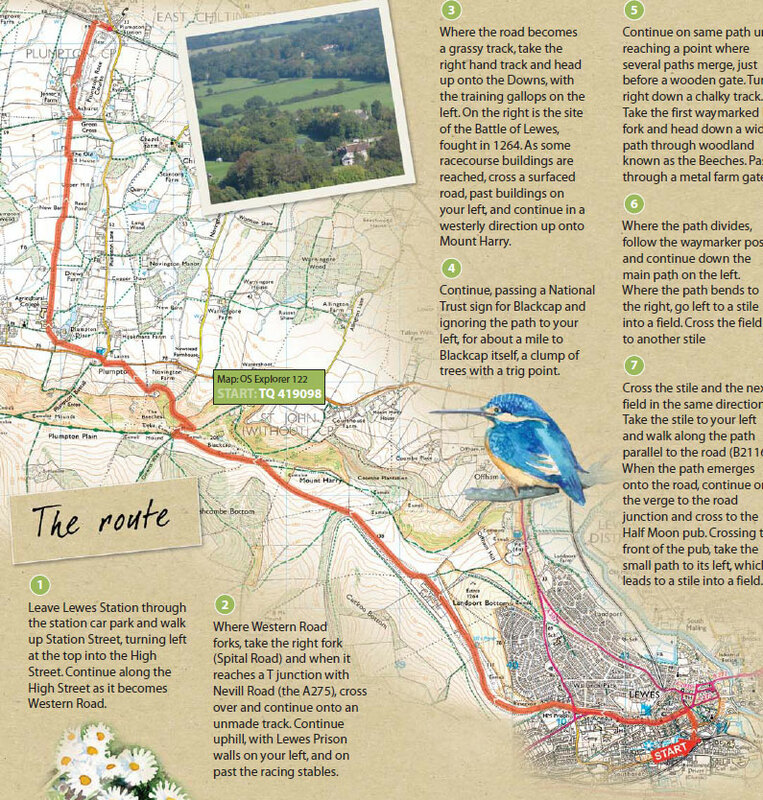 You can download leaflets mapping 16 of the best routes from here, with notes on local flora and fauna and sites of special interest. The walks are of varying lengths and grades of difficulty, and all start at or near Plumpton station, which has a daily train service from London Victoria and Hastings/Eastbourne. Plumpton also has four pubs and a village shop for refreshments and supplies. A lovely, circular, wooded walk to the north east of Plumpton Green, starting and finishing at Plumpton Station. Passing via Hattons Green, South Chailey and Yokehurst Place, it is mostly across fields, with some farm tracks and short stretches along roads. 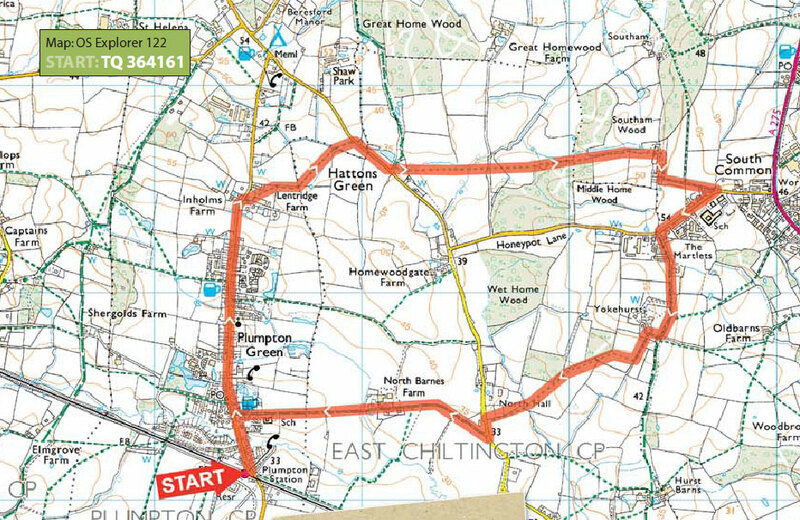 A circular walk to the east of Plumpton Green, to East Chiltington, starting and finishing at Plumpton village hall. Taking in local farms and East Chiltington Church, the walk includes lovely views of the Downs, stretches of farm tracks and some seldom used, unmade roads. 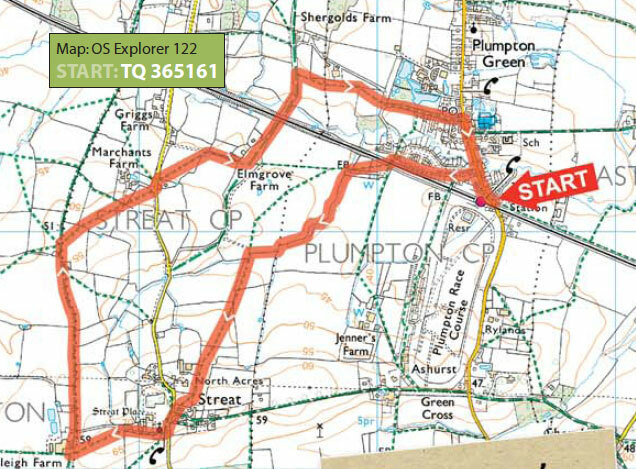 A circular walk to the east and south of Plumpton Green, starting and finishing at the entrance to Plumpton Station. 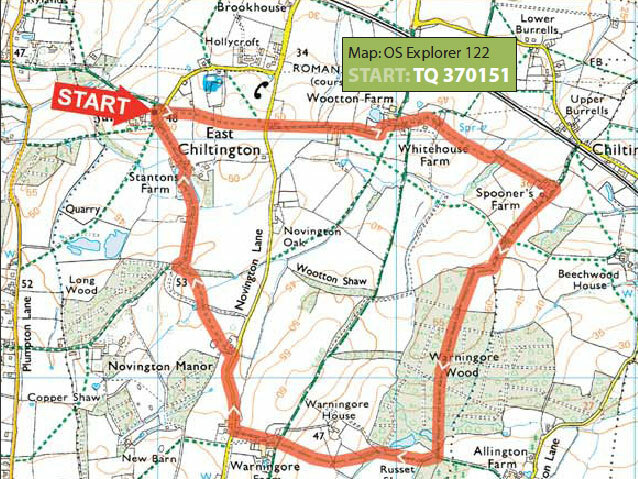 Leading to the Jolly Sportsman pub in East Chiltington, via Percy’s Patch, and returning via the Old Mill House, this is a generally flat walk, with some gentle undulations, mostly on firm tracks. 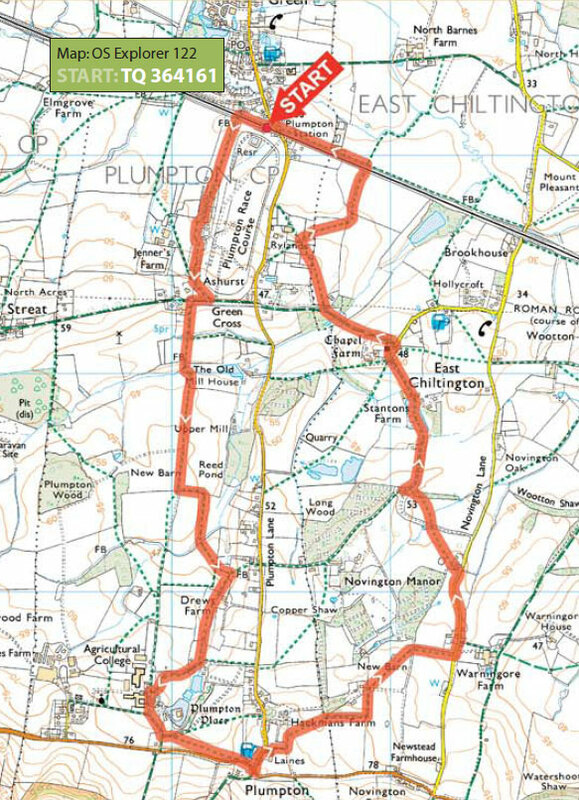 A circular walk to the south of Plumpton Green, towards the Downs, starting and finishing at Plumpton Station. 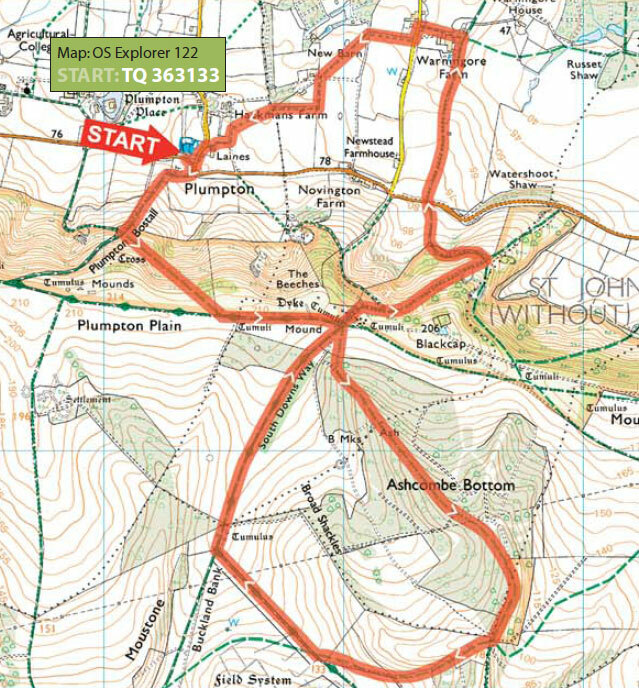 Passing via the racecourse, Plumpton Place and Stanton’s Farm, it mostly follows footpaths and is generally flat, with some gentle undulations. 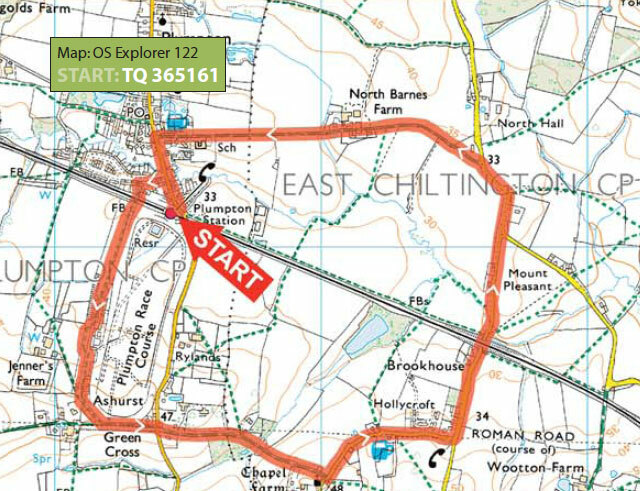 A circular walk to the south east of East Chiltington, starting and finishing at East Chiltington Church. 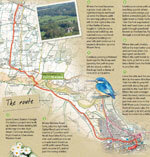 Passing through woodland, fields and along farm tracks, this is a lovely, varied walk. 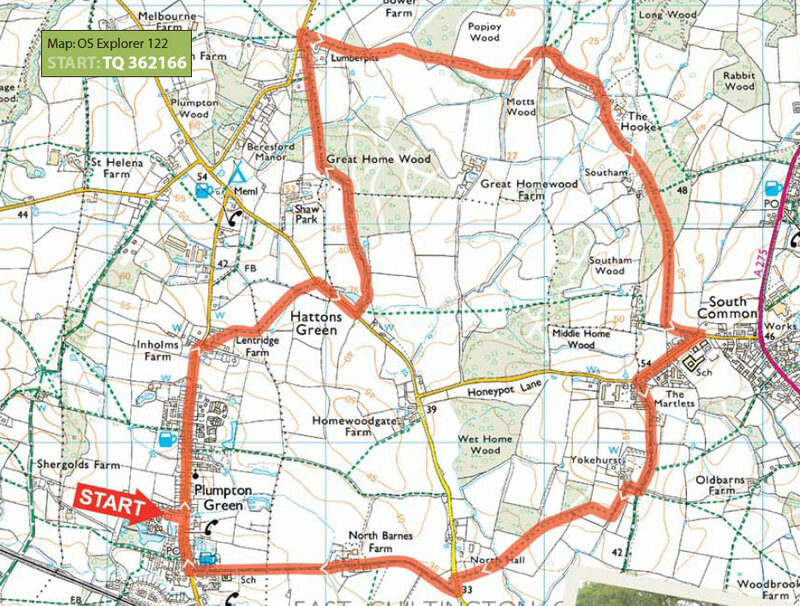 A figure of eight walk to the south east of Plumpton, starting and finishing at the Half Moon pub. 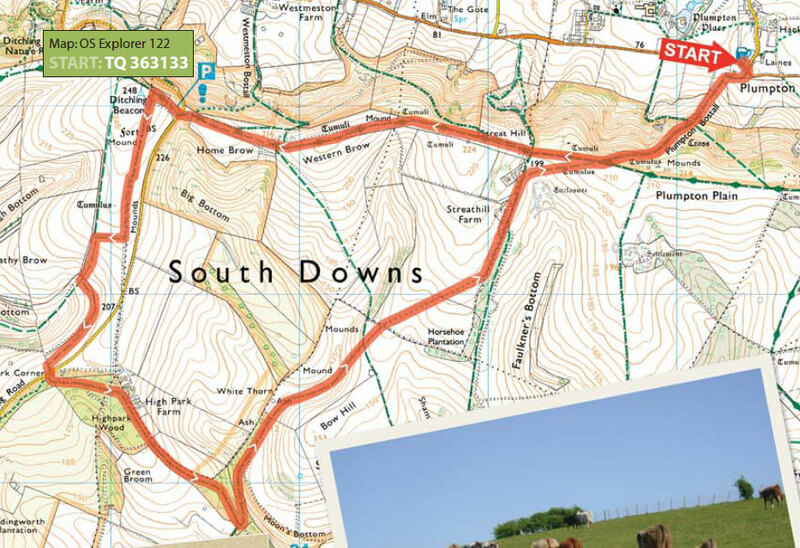 Largely on the South Downs and passing Blackcap, this is a hilly walk, with steep climbs and descents, wonderful views and lovely stretches of woodland and downland. 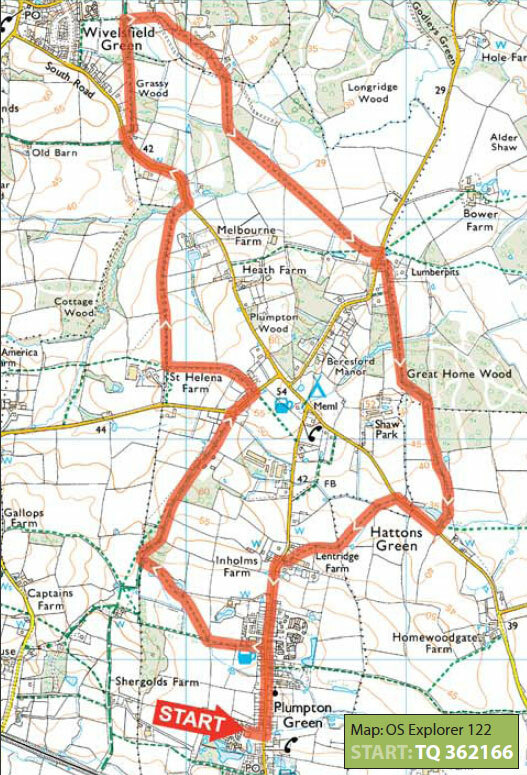 A circular walk to the south west of Plumpton Green, starting and finishing at the junction of Plumpton Lane and the B2116 at the Half Moon pub. Passing along the South Downs Way, the early stages of this walk provide a spectacular view of the Low Weald. This walk covers a mixed terrain with a steep climb and descent and long, gently undulating sections. 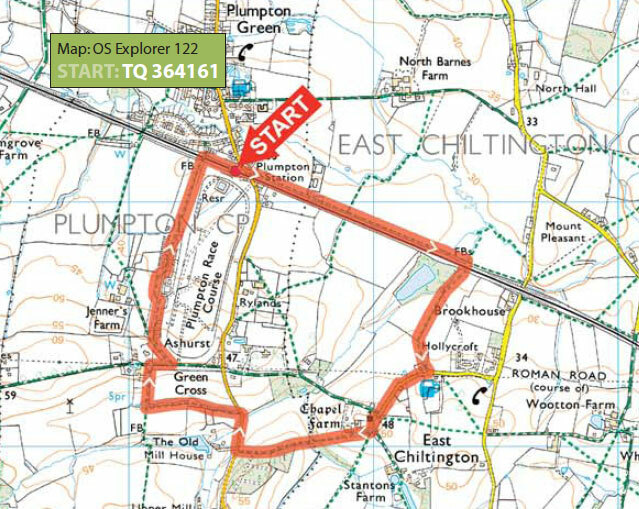 An interesting circular walk to the east of Plumpton Green, starting and finishing at the George V Playing Fields, opposite the station. Passing via the racecourse and East Chiltington, it uses quiet lanes and wide tracks with no stiles, and offers splendid views and plenty to see all year round. 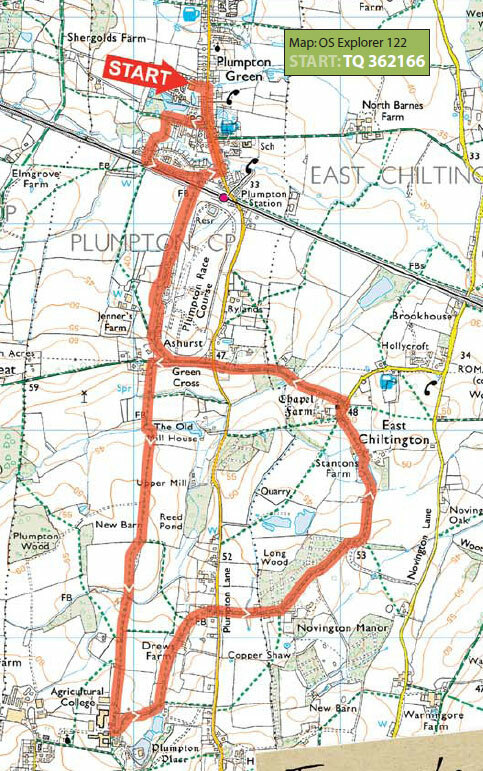 A circular walk to the south west of Plumpton Green, starting and finishing at the George V Playing Fields, opposite Plumpton Station. Reaching the neighbouring village of Streat, it passes along a Roman road with lovely views of the Downs. 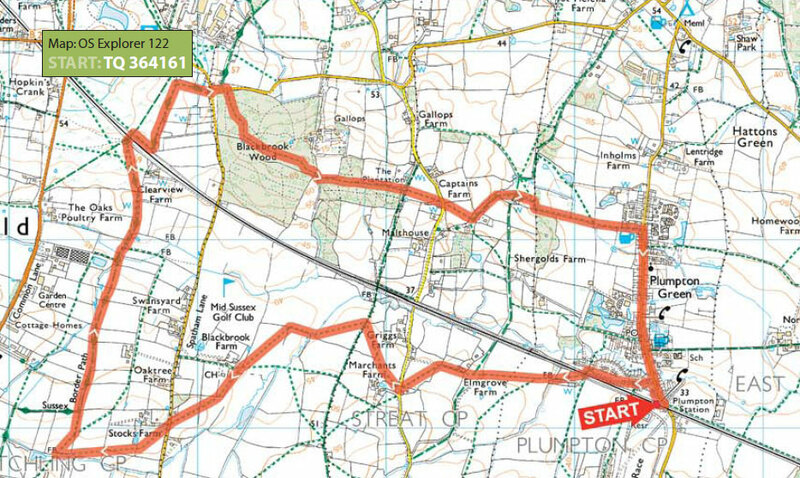 A varied, circular walk to the west of Plumpton Green, starting and finishing at Plumpton Station. Passing via Mid Sussex Golf Club and along the Border Path, it reaches Ditchling Common before returning through lovely woodland. It is mostly on level ground but includes myriad stiles. 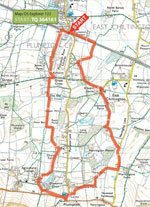 A circular walk to the north west of Plumpton Green, starting and finishing at the village shop. Largely passing over fields and through local woods, it is a particularly beautiful walk at bluebell time. A lovely varied, circular walk to the north east of Plumpton Green, starting and finishing at the village hall. Passing through woods and over open pastures, it uses well marked paths and few roads, with no steep inclines. 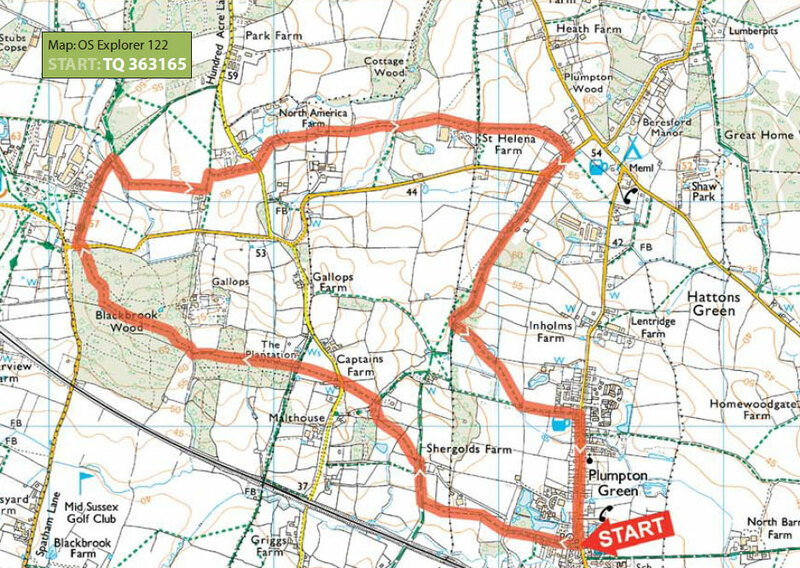 A circular walk to the north of Plumpton Green, starting and finishing at the village hall. Passing near the Plough inn and St Peter and St James Hospice at Wivelsfield Green, it returns via Great Home Wood and is a rich and varied walk, mostly across fields with a few stretches along roads. 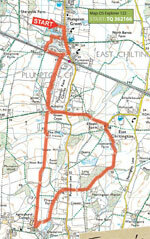 A circular walk to the south of Plumpton Green, starting and finishing at the village hall. 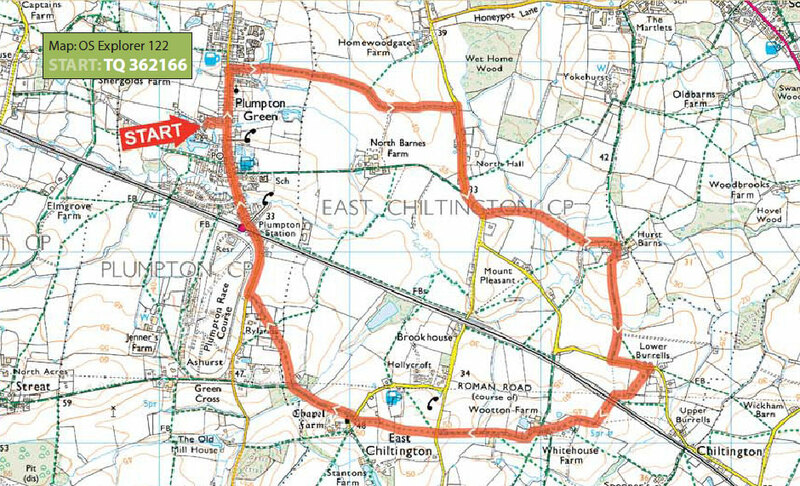 Initially exploring the hidden footpaths of the village, it heads towards the Downs, to Plumpton College, before returning via East Chiltington. 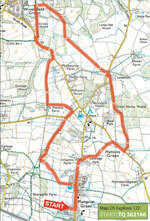 It follows public footpaths and is a generally flat walk with some gentle undulations. A walk in one direction starting at Lewes Station and finishing at Plumpton Station. This walk winds its way through the historic town of Lewes and up onto the Downs to return to Plumpton Green. It includes some steep climbs and descents, with stretches of gently undulating land between. 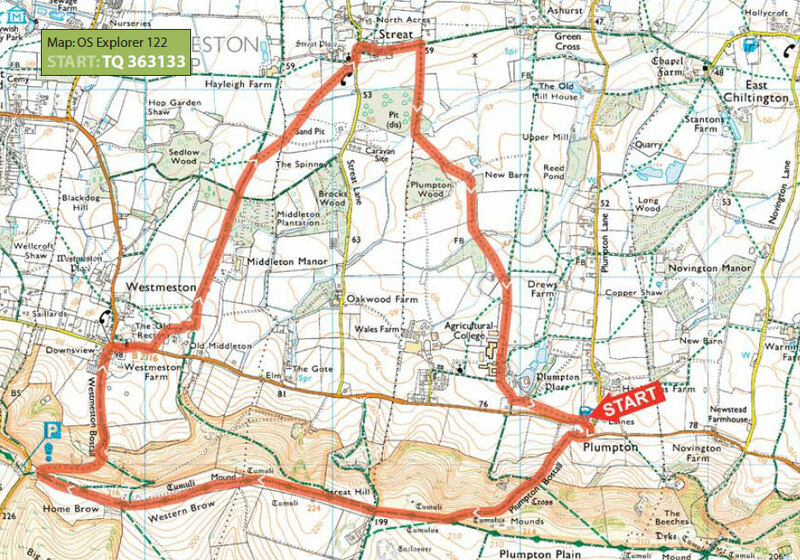 A hilly, circular, downland walk to the south west of Plumpton, starting and finishing at the Half Moon pub. Offering spectacular views at Ditchling Beacon, this walk is wholly on the South Downs and includes steep climbs and descents.